Last April, students from the Turnaround Arts schools at DMPS took over Hoyt Sherman Place for a couple of days, kicking off the first Project Stage festival, a celebration of the visual and performing arts. From mini-versions of Broadway musicals to a gallery exhibition of photography, the festival highlighted the talents of the students who attend six Des Moines schools where the arts are integrated into every classroom. Project Stage is preparing for its second act, to be held this April 25-26 again at Hoyt Sherman Place. The 2019 version of Project Stage will once again feature musicals performed by participating schools along with performance by some DMPS teachers. Talks are still in the works with the Turnaround Arts program, headquartered at the Kennedy Center for the Performing Arts in Washington, DC, about a national artist joining the festival. One aspect of Project Stage is a photography workshop. Students attend after school on Wednesdays to learn the finer points of using a camera. 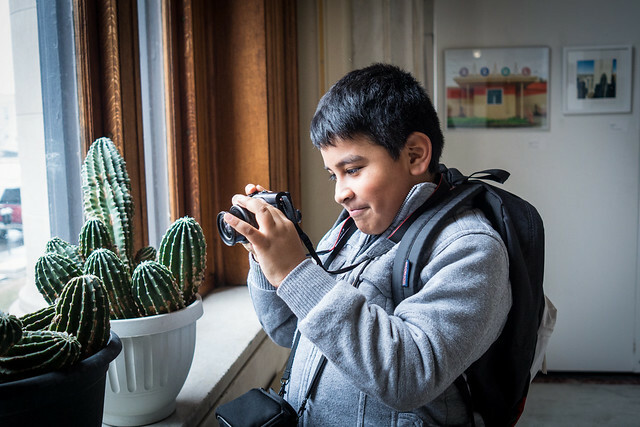 School district photographer Jon Lemons is the “teacher,” helping students understand everything from how a camera works to how to shoot in a variety of styles to preparing for a public exhibit. And this year, students graduated to real cameras. After using disposable film cameras in 2018 (the kind you buy at a souvenir shop or the local drug store), thanks to support from the DMPS Foundation students now are using a Canon M100, a quality digital camera, to learn on and make their creations. This Wednesday, students took a field trip downtown to the Polk County Heritage Gallery to see the new Captured in Des Moines exhibit. It was a chance for the students to see the work of several local photographers (including Lemons and DMPS communications director Phil Roeder), while practicing their own skills. The Turnaround Arts schools at DMPS include Harding Middle School along with Cattell, Findley, Madison, Moulton, and Oak Park elementary schools. Keep an eye out for more information on this year’s Project Stage festival.